In stock -This product will ship today if ordered within the next 4 hours and 45 minutes. 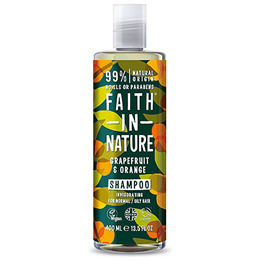 Grapefruit and orange are both known for their cleansing qualities, and this shampoo zings with their organic citrus aromas to help energise your day. 100% natural fragrance, with essential oils. Free from parabens and SLS. Aqua, Ammonium laureth sulfate, Maris sal, Cocamidopropyl betaine, Polysorbate 20, Chamomilla recutita flower extract, Citrus aurantium dulcis peel oil, Citrus paradisi peel oil, Camellia sinensis flower extract, Camellia sinensis leaf extract, Litsea cubeba fruit oil, Citrus reticulata peel oil, Tocopherol , Glycerin , Helianthus annuus seed oil, Citric acid, Sodium benzoate , Potassium sorbate, Curcumin CI 75300, Citral, Limonene. 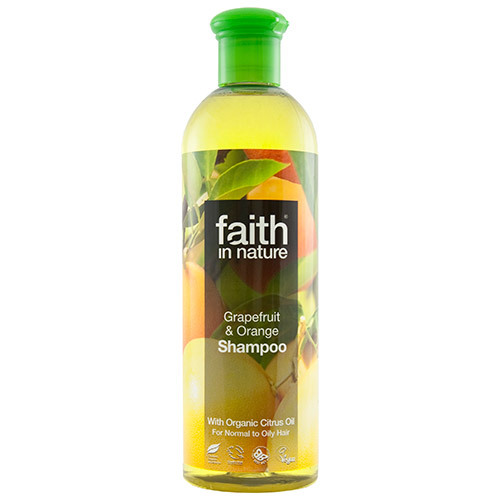 Below are reviews of Faith in Nature Grapefruit & Orange Shampoo - 400ml by bodykind customers. If you have tried this product we'd love to hear what you think so please leave a review. I developed sensitive skin through stress and cannot use normal shampoos as they bring my scalp out in lumps. I find this brand is fine with my skin, although the Lavender is still too strong so I always buy the Orange and Grapefruit as I know that this does not cause a reaction. Love this shampoo! Well worth every penny. I love the fragrance and this shampoo leaves my hair in excellent condition.